When Andrew and I founded Layershift (we were called CodeRedHosting back then), it was with a shared vision and passion for overwhelmingly excellent customer service and support. Even though it was during our tender teenage years, we were both already utterly fed up with the status quo. Companies who thought bad service was “good enough”. Unlike most in our peer group, we set out to do something about it. 15 years later, and it’s refreshing to take stock and assess what we’ve achieved so far. This time last year, we were honoured – if not slightly shellshocked – to be independently recognised as the best support team in Western Europe for 2014. Without breaking into an Oscar speech, this is only possible thanks to the hard work and commitment of each person in our team. From the top management through to the junior engineer. It doesn’t just happen by accident. Nicereply have just announced their 2015 winners. Guess what? We’ve only gone and done it again! Best in Western Europe for the second year running! Unlike various nonsense “review sites”, this is not a charlatan award purchased via some cosy sponsorship arrangement – those in the industry will know well which “review sites” I’m referencing. Nicereply analysed over 1,000,000 end user feedback ratings from companies right around the world. Think about that for a second: 1 million feedback ratings, and Layershift are the company that consistently delights its customers the most across all of Western Europe. The fastest was fully resolved in only 20 seconds – yes, super tech. Ioan Nistor was really fast on that one – a Monday evening no less! Proactively resolved over 100,000 monitor alerts – saving our customers from performance degradation or downtime. 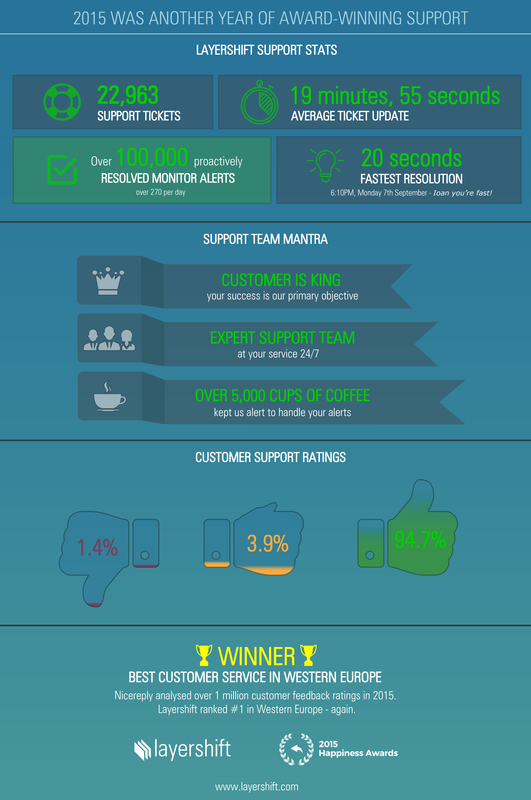 Our customers are asked to rate every single support interaction (each individual response) with a score from 1 – 10, as well as provide feedback comments for management review. It’s particularly notable that we improved our positive scores (+1.3% vs. 2014), suggesting that our customers are even more delighted by our support quality than ever before. Many thanks for appreciating the hard work and dedication we all put in throughout the company! Industry peers sometimes ask how we manage to achieve such consistently high ratings. Across all industries, customers have a bias towards sharing negative experiences over positive ones (i.e. twice as likely to share a complaint than to share praise). In other words, if we do something bad you can be sure there’s a low feedback score (and hopefully a detailed feedback comment) on its way. Yet good service is often taken for granted – when things work how they’re supposed to, it’s human nature for that to go unnoticed – service has to be excellent to motivate most people enough to actively give praise. It’s a well worn phrase, but this is actually the point – for most companies it is only a phrase. For Layershift, if you’re not successful, if you can’t achieve what you set out to do, we have failed you. When a customer hits a technical limitation or obstacle, we make it our absolute mission to find a way forward. We exist purely to help your business reach its objectives. If we’re getting in the way of that, or need to deliver something slightly differently to help with that, we always try our best to solve that issue. Whatever it takes. Many companies, including our partners, hide their most talented and skilled team members behind layers of varying degrees of “unskilled message passers”. Here’s the headline – your prize assets work best covered in mud! When you’ve got great problem solvers, it makes much more sense to put them directly in touch with the problems instead of insulating them from the action. What this means in practice is that at Layershift customers deal with someone who can solve their issue, independently – usually in the first interaction. No escalations. No inaccurate half truths. When clarification is needed on either side, it’s served by someone who knows what they’re talking about. Quite frankly, that is so rarely the case at many other organisations. Hence that sinking feeling you get when you come to the realisation you know more about the issue you’re asking for help with than the person you’re talking to! Night shifts are tough. So are early mornings and late nights. Nobody likes them. But there’s a little cup of magic that helps to fuel many on our team, and make sure we’re always alert to react to those monitor alerts – even at 3am. Ok, the main point is not actually coffee. It’s about taking good care of your team and trying to treat them as well as possible. A motivated team who share your passion for customer success are much more likely to pull through those tough times, and deliver the best service they can to every last customer. We estimate that between us we consumed over 5,000 cups of coffee in 2015 alone. Sobering thought. Our customers spend their time doing the things that make them money; not banging their heads on the desk following another wasted hour with clueless support agents, and certainly not tinkering with servers! The quality of service that we deliver enables our customers to be more productive than their competition. Increased productivity that translates directly into increased profits and growth. Dear customers, we appreciate every word of your feedback; we are truly humbled that your ratings throughout 2014 and 2015 demonstrate that we provide the best service in all of Western Europe! Thank you for taking the time out to tell us how we’re doing. It really means everything to us. Layershift allow us to concentrate on our core business and act (almost) like a 24×7 in-house IT department, but at a fraction of the cost – and we don’t have to make them coffee! Whenever there are technical issues beyond us, Layershift expert engineers are quick to respond to our support questions and simply ‘sort’ everything for us, making everything very very easy! We switched from an expensive dedicated server from another company to the Layershift Cloud VPS and it’s fitted our needs perfectly with great reliability and excellent customer support.